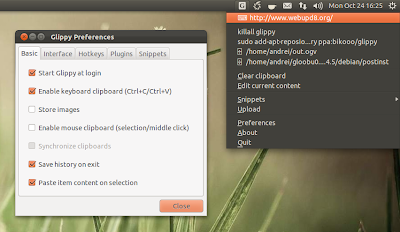 Glippy is a clipboard manager for GNOME that comes with some cool features: it can upload text to pastebin.com or images to imgur.com, execute actions on the current clipboard content and more. You can even quickly access the clipboard history without using the indicator / tray icon by using CTRL + ALT + Shift + C (this keyboard shortcut is configurable). Glippy works with both Unity (comes with Ubuntu Indicator) and GNOME Shell. Tip: move it to the top GNOME Shell bar using Iconmanager extension.